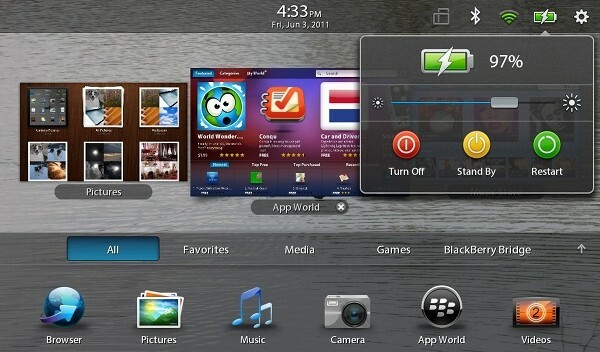 Blackberry’s PlayBook isn’t even two months old and has just received a second update to its QNX-based OS. The BlackBerry Tablet OS v1.0.5 features an upgraded Facebook app, which is now a preloaded part of the system software and is now able to do some neat things… like deleting unwanted messages. Developers will be happy to hear that they can include in-app payments, while non-english speaking users should be excited about the expanded language support. You can expect a few more changes, including some enterprise-friendly tweaks to video chat, a new pop-up power menu (pictured below), and the ability to charge even when the device is turned off. The update is available now and while you wait for it download, check out the source link for more details.